Judging by the feedback we’ve gotten from you people, we feel we should probably stick with this Only Watch coverage as much as possible. Thanks for the comments on these amazing timepieces. Today we have Bovet’s entry to the famous charity auction. 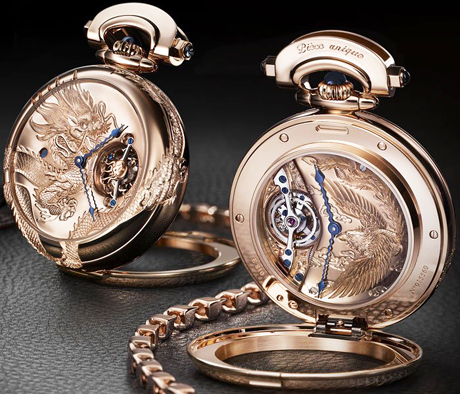 Called the “Seven Day” watch, Bovet sets the assembly in a rose gold chassis bearing custom engraving of a dragon and phoenix. The Chinese mythological icons represent many things many people including luck, prosperity, immortality and much more. Due to to the fine craftsmanship, it took no less than 100 for the engraving alone. Adorned with pearls and more gold, this watch is opulence beyond opulence and decadence beyond all belief. Buyers will choose between a 24 karat gold chain or an alligator skin strap. The only watch auction to raise money for Muscular Dystrophy will take place in Monaco, this September. This entry was posted in Accessories and tagged Monaco, Muscular Dystrophy, Seven Day. Bookmark the permalink.